Pink for ladies? How original! I'm sure you've all seen them. Variants of pain relief products that claim to target a particular type of pain, usually migraines, back pains or period pains - but which contain exactly the same ingredients as the regular pain killer. Now maybe you could argue that they provide placebo relief, though I'm not sure that would make a great proof point for a campaign... but what really makes these products a complete pain in the arse is how much more they charge for them. You can buy generic pain relievers for very little money, and branded pain relievers for a bit more money - but targeted pain relievers, well they cost a bit more. Except, rather like homeopathy, you aren't really paying for anything other than a new run of packaging, and for this privilege you can sometimes be charged TWICE the price of the regular branded version. For years these products have annoyed the hell out of me, providing absolutely no proof that they do what they claim to do. Finally though, someone has been doing something about it. "Where can we get these Placebos?! Maybe they're in that truck!" 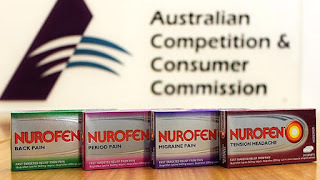 The ACCC (Australian Competition and Consumer Commission) has been pursuing action against Nurofen* and Reckitt Benckiser* for their range of these painkillers, and not only have they forced the range to be taken off shelves, but customers now may be able to get their money back. This is excellent, because I for one am so sick of marketing that lies. In this age, we have to be truthful if we want to succeed. Yes we need to be clever, write well and look great, but the essential things we say have to be based on reality - and the simple fact is that these products were absolutely not. Well done to the ACCC for helping marketing and brands take a step towards real honesty. After all, it's the brands that really suffer in the end. I wonder how many customers Nurofen have lost because they felt so ripped off by a false claim? Given that the real positive features of some of the range (E.g. : Faster absorption) are actually good. But why would anyone want to pay a premium in the future for a brand that lies to them, and rips them off in the process? Hopefully this is the last we EVER see of this lie. *I should add, Nurofen are by no means the only brand I've seen doing this practice. I recall seeing other brands by different healthcare companies doing the same thing back in the UK.